Home / News / Trending / Chief economist on TRAIN Law: "This is to address poverty and inequality; Ito yung gasoline ng gobyerno"
Chief economist on TRAIN Law: "This is to address poverty and inequality; Ito yung gasoline ng gobyerno"
During a media interview, Department of Finance (DOF) Undersecretary Karl Kendrick Chua explained why the Tax Reform for Acceleration and Inclusion (TRAIN) law is the answer to the problem of poverty and inequality in the Philippines. 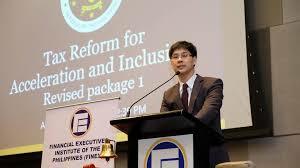 “This tax reform is really to address poverty and inequality more than anything,” Chua said. He explained that governments run on taxes, but whereas the previous tax reforms focused on increasing revenues to pay off debts, President Rodrigo Duterte said the higher taxes are to fund the projects of the government that will address the issues of poverty. “Ang past reforms kasi is really to raise revenues because we have so much debt or we have big deficit. Today, as you know, the economy is solid. We are recognized globally,” the Finance undersecretary explained. Chua even explained that “acceleration” specifically meant to increase the Gross Domestic Product (GDP) growth from 6% to 7%-10%, while “inclusion” meant to include everyone in benefitting from the high economic growth of the country. “Inclusion means no one is left out, we want everyone to have equal opportunity to participate,” Chua said. He explained the, currently, Philippines is suffering from high inequality where the rich remains rich or becomes richer while the poor remains poor or becomes poorer. The TRAIN law serves the exact purpose of levelling the economic field for all citizens. “Kaya kailangan po tayong lahat na Pilipino ay may maimbag tayo sa ating mga public goods pero gagawin natin mas equitable so mas mayaman, mas malaking contribution, mas mahirap, mas maliit (contribution),” Chua explained. Public goods refers to services and products that cannot be acquired or sold by a private citizen, but one that the government can. This refers to education, health, roads, transportation, communication, and other sectors and needs that the government needs to provide its people with. “Ito ay responsibilidad ng gobyerno para ibigay lalo na sa mga mahihirap,” Chua said. In the interview, the Finance undersecretary cleared out that every government needs taxes. “The link is very clear. Without the taxes, as the President said, ito yung gasoline ng gobyerno. Kung wala itong new taxes na ‘to, which we can do very equitably, wala po tayong pondo para sa k12, sa universal health care, para sa massive infograph natin sa MRT, sa airport, halimbawa lang,” he explained. This is why Chua called on the participation and help of all Filipinos that, through taxes, the biggest issues in the country may be fixed.